The Switzerland biscuits market is fragmented, thanks to the presence of a massive pool of large, small, and unorganized vendors due low entry barriers, states a new report by Transparency Market Research (TMR). Lefèvre-Utile, Confiserie Sprüngli AG, Walkers Shortbread Ltd., Kägi Söhne AG., Wernli AG, Kambly SA, Barilla G. e R. Fratelli S.p.A, Nestle S.A., Lotus Bakeries N.V., Burton’s Food, HUG AG, Midor AG, and United Biscuit are some of the key vendors of biscuits in Switzerland. With continual entry of new players, the competition within this market will remain rising over the next few years, states the research report. According to the research report, the Switzerland biscuits market stood at US$0.97 bn in 2015. Rising at a CAGR of 1.70% over the period from 2016 to 2024, the market is anticipated to reach US$1.12 bn by the end of the period of the forecast. In terms of the volume, the market will rise at a 1.20% CAGR over the same period. The consumers of ages between 20 and 30 are the main contributor to the overall revenue generated in this market. In 2015, this segment accounted for around 28% of the overall market and the scenario is likely to remain more or less the same in the near future, notes the market study. In terms of the product type, the Switzerland market for biscuits has been classified into bourbon, rich tea, chocolate coated biscuits, plain biscuits, and filled biscuits. Among these, the chocolate coated biscuits segment is dominating the overall market and this scenario is expected to remain so over the next few years. The segment held a share of 36.9% in the overall revenue generated by this market in 2015 and is projected to account for 39.4% by the end of the forecast period. On the basis of the volume, the plain biscuit segment is leading the Swiss market, states the research report. 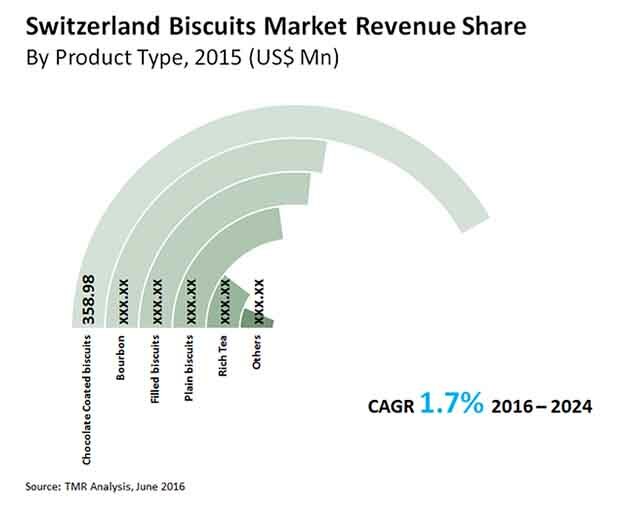 “The Switzerland biscuits market is benefiting substantially from the rising influx of tourists in this country over the last few years, which has made a massive influence on the sales of local biscuits, confectionary, and bakery products,” says a TMR analyst. The number of international and domestic tourists in Switzerland is projected to increase at a healthy rate in the years to come, which is anticipated to lead to the emergence of the tourism sector as a strong growth driver of the Switzerland biscuits market in the near future, reports the market study.